Dorjee Tseten shares a powerful Lhakar moment observed by 2000 Tibetan students in Dharamsala and a creative political theatre by organized by SFT India calling on the UN to take action for Tibet. 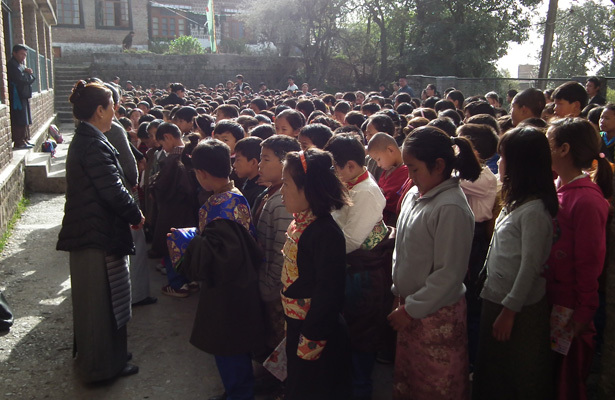 It is a milestone step to see thousands of Tibetan students in exile joined Lhakar movement to show their solidarity for the Tibetans inside Tibet in this critical time. On other hand SFT-India staged a strong dramatic theater action in Dharamsala to call UN and world leaders to intervene on going critical situation in Tibet. 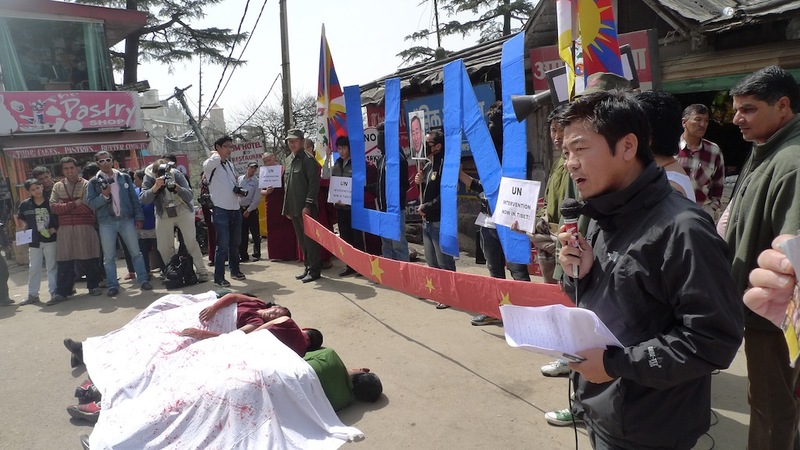 Activist dressed up as International press, UN General Secretary, Chinese soldiers, Tibetan monks and layperson carrying Tibetan flag marched through Mcleod Gunj to re-enacted the brutal repression of peaceful protests inside Tibet. Tibetan monks and lay people were seen lying on the ground, covered in blood, and surrounded by Chinese military. Then the bystanders were asked to deliver petition letters to Mr. Ban Ki-Moon, urging him to send a Special Envoy into Tibet. Tsewang Dhundup, a Tibetan who narrowly escaped Tibet after being shot by Chinese police for taking part in a peaceful protest in 2008 also joined the action and gave a moving speech. He said, In a free world where people are concern about the Animals Rights why can’t Tibetans have their basic Human Rights. The situation in Tibet right now is as critical as the 2008 uprising where so many innocent Tibetans were killed. He call for urgent UN action and World leaders to save Tibetan lives. Bystander Indians and foreigners who have seen this action were moved and shown their support and pay solidarity to the Tibetans who have lost their lives. Visit SFT-India’s blog for more information. SFT calls for UN intervention in Tibet through street theater at Dharamsala March 21, 2012 from VOT on Vimeo. ← Tibet Lobby Day USA!